I've had the impression for a little while now that Keith's so mad at Penn State for the college's long unaddressed sexual abuses that he wants everyone, including the students, to shun it. Over the past few days he's been responding to PSU students on Twitter with scornful comments because of their association with the school. The whole thing culminated in his remarking "Pitiful" at a student who tweeted about the results of a fundraiser for kids with cancer a couple days ago. He tried to say that the comment was aimed at the students, not the charity effort, but the distinction was so hard to accept that he has finally had to apologize for it. I apologize for the PSU tweets. I was stupid and childish and way less mature than the students there who did such a great fundraising job. Yeah, that was unfortunately Keith letting his emotion get the better of him. Keith should have apologized as soon as he was informed that the tweet was about cancer fundraising. ^He hasn't said a thing since he posted his apology. Looks like he decided to take himself off Twitter for a while, too. The tweets on his timeline were coming in at a rate of 40 a minute earlier today -- mostly retweets of blog headlines announcing the suspension. I can imagine him thinking, in the words of his old catchphrase: "I have nothing more to say about this that is either relevant or true." Twitter is not a good thing for anyone who is sensitive or defensive. dnkoa wrote: Twitter is not a good thing for anyone who is sensitive or defensive. Yeah, well... it was the student who tweeted her "how you like me now"-type comment at Keith and tried to stick the success of the charity in his face who was being defensive. He just said what SHE ALREADY KNEW was his opinion re anyone who attends that school. So she was in a sense trolling. It was his timing that was off b/c it was an invitation to other trolls to displace his comment to the charity, rather than the intended target namely the student. I think everyone understands he wouldn't pronounce a cancer charity "pitiful," since he lends his name and donates serious money to charities all the time. It wouldn't surprise me if he had made a big honking donation to THON without being asked. His tweets about the intelligence of PSU students, seemed really childish to me. The Icy Commander wrote: His tweets about the intelligence of PSU students, seemed really childish to me. What a coincidence, Icy; your understanding of just about everything seems childish to me. Keith is outraged by PSU's negligence regarding abused kids. They let it go on and did nothing. He thinks the college has not purged itself of guilt -- instead acting defensive and prideful about Joe P. and his so-called record of victories. If you looked at it that way, you'd find it tiresome when PSU apologists keep telling you to "get over it," too. Being a liberal, Keith has a tendency to make the plight of the weak his own fight. ESPN said in a statement that Olbermann will not host his show for the rest of the week. 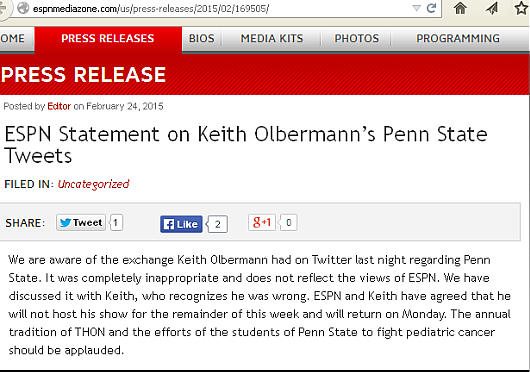 "We are aware of the exchange Keith Olbermann had on Twitter last night regarding Penn State. It was completely inappropriate and does not reflect the views of ESPN. We have discussed it with Keith, who recognizes he was wrong. ESPN and Keith have agreed that he will not host his show for the remainder of this week and will return on Monday. [March 2, 2015]"
^We're on it, Steven; scroll back thru the 8 posts which preceded yours. If only this article had been published the day before Keith popped off to that PSU student; he could have read it and taken counsel from it -- and, best of all, avoided having been included in it. You know, thinking back, I wonder if his first instinct NOT to get a Twitter account didn't have a lot of merit after all. Just for his sake. Staying away from all that fast-flying crap if you're celebrity probably adds years to your life. When I came to your studio a few months ago to produce a My First Big Break segment, many people throughout the industry warned me to essentially "walk on eggshells" and called you everything from intimidating to difficult. You turned out to be charming, patient and extremely candid… resulting in a terrific piece on your break in the industry. Basically, your haters couldn’t have been further from the truth. So, Keith, please don’t do anything else to give ESPN executives a reason to take you away from us. The sports world simply can’t afford it. ...and since he started tweeting again, late afternoon on Friday, he's put up 6 tweets about dogs, and one about Ann Coulter. So... that makes 7 tweets about dogs, right? 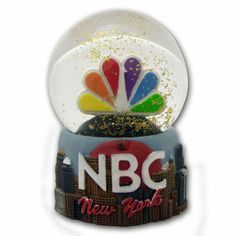 The latest snowglobe-like shakeup at NBC News has seen, among other replacements, the acquisition -- and nearly immediate dismissal -- of Keith's erstwhile exec producer and 'Olbermann' show developer Jamie Horowitz. Mr. Horowitz began his new stint at NBC last September but was bounced after only 3 months with the network, NBC paying off almost all of the remainder of his contract to effect his departure. The details of his experiences there are sketchy; reportedly the radical redesign he envisioned for the Today show (the mission for which he was offered over $3-million if he could break his contract with ESPN) was too much for his boss, Deborah Turness, at that time the president of NBC News. In a surprising turn of events, Ms Turness was then given HER walking papers! As Dorothy remarked in the Wizard of Oz, "Goodness! People come and go so QUICKLY here!" Keith's show will be pre-empted by some games or something for the next 3 days. 'Olbermann' returns on Friday, March 13, 2015.